I stumbled onto the first way to start your own online business or income stream over 20 years ago. But I had no idea at the time. I spent a good part of the summer of 1994 playing pool at CP’s house with my buddies. We played pool (aka billiards) a lot during high school, but that summer stands out in particular because that was the summer CP brought back a few bootleg tapes from his boarding school up in Virginia. The tapes were of this new band that was causing quite a stir up there. If I recall correctly, the band had played at CP’s school and some of his friends used devices to record the show. The music was captivating. The lyrics were catchy. It was an eclectic group of talented musicians playing a style of music we had never heard. A mix of rock, funk, folk, jazz, and even a little bluegrass. The band had the standard guitar and bass. But they also had a sax player. And a violin. And the drummer was clearly some sort of musical prodigy. They called themselves the Dave Matthews Band. We were instant fans. In fact, as a freshman in college the next year I would pay $10 to see them at a small club in Raleigh, NC, The Ritz. I was no more than 5 people deep from the stage for the majority of the show. A good friend of mine, Steve, and I stuck around after the show until everyone had just about cleared out. We hoped to meet the band. We chatted with Dave and Boyd Tinsley about the show for a bit. And somehow I managed to take home one of Carter Beauford’s used drumsticks. As a drummer, that meant a lot to me. And its significance would only grow with their rise in popularity. In the years following, I ended up seeing them another 15+ times. I had t-shirts. Stickers. Hats. Bootleg tapes. And every CD and DVD they put out. If they made it I bought it. This is the type of relationship you want to have with your audience. In fact, this is one of the three methods I us to show you how to start your own online business or income stream. BONUS: Grab this free download, “10 Proven Ways to Earn $10,000 Per Month Online”, before you go. I’ll also send you other free resources and exclusive content about starting a profitable side business or blog. Only, I didn’t name it after the Dave Matthews Band. While there are some pretty dedicated fans of the Dave Matthews Band. They pale in comparison to the fans of The Grateful Dead. Known as Deadheads. Deadheads are more than a group of people that love a band. They are a community. A tribe. They’ve gone all in. It’s a way of life. They dress a certain way and talk a certain way. They all have a similar world view and common interests. Because selling to them is easy. And it’s repeatable. Concerts. T-shirts. Albums. Clothes. Crafts. Stickers. Food. Drink. Year after year after year. It’s a built in, dedicated audience. And that’s what the Deadhead Method is all about. When using the Deadhead Method, your focus is going to be building your own dedicated audience. Fans. A tribe. A group of people that are interested in, and passionate about, what you’re doing. And about You! Once you have your dedicated fan base, you can ask them what they want to buy. Then make it and sell it to them. When you understand what they want and need, you can keep coming back with offer after offer. Year after year. You will no longer have to spend huge amounts of precious resources trying to find new customers. For you, it might be an eBook, then a workbook, then an online course, and then a physical product, like a book or a journal. It could even culminate in a large, live event. This is also a great route to take if you want to sell attention – ads, sponsorships, or affiliate offers. But let’s be clear. This is not an easy path to take. The Dave Matthews Band didn’t become an overnight success. Neither did The Grateful Dead. If you know anything about bands, you know their struggles. You know that in the early days they spend 300+ nights per year on the road. Playing shows. Usually in small venues. Bars. Clubs. Barely getting paid enough to buy food and gas to make it to the next gig. For you, it might not take years or decades to build a fanbase like the Deadheads. But just remember, you might be able to build a lifelong fan base in as little as 1 to 2 years. It’s an investment that will pay off tremendously. If you want to earn a few hundred to a few thousand dollars per month, an income stream, without having to start your own online business. This is the route I would suggest. Even if this whole idea seems foreign to you, the long-term benefits are huge. I also call this the street vendor method or the swap meet method. It’s the exact opposite of the Deadhead Method. Rather than taking the time to build an audience or fan base, you start with the sale. You find something that people will buy, and you sell it to them. You may end up with fans. People who love your product or what you do. But that’s not the focus. Not in the beginning anyway. No, your focus is on finding or creating a product or service that people will buy before you do any work. To find something people will buy, you’ll go through a process of generating ideas. Things that you could offer. Think about a flea market, or a street vendor who spreads out a few dozen items before you. They’re constantly looking for what’s Hot. What people will buy. Once they see what works, they bring in more. If it doesn’t sell, they get rid of it. For you, this could be a product or a service. You’ll determine a possibility, and pitch that to individuals or small groups. If people eagerly buy, you’re on to something. You can start building from there. The upside is that you may be able to find something that generates residual income online fairly quickly. Like selling a product you make. A t-shirt design. A subscription to gourmet coffee. An eBook on wedding planning. The downside is, well it’s not really a downside, it’s just that this is more like a business than a simple, residual income stream. Which means in order for you to scale it and make more money, you’re going to need systems. And often people. Especially if you find a physical product. Someone has to make the product. Ship it. Deal with returns. Customer service. Bookkeeping. Taxes. Although, the good news is that today, there are websites and service options to make it less time consuming. So even if you manufacture a product, you don’t have to let it consume all of your time. You can get virtual assistants, or use a drop ship company, or even outsource customer service. 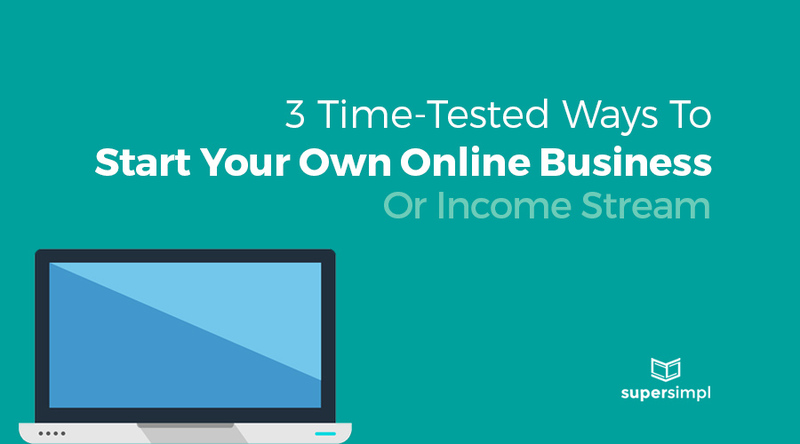 This is a good option for you If you’re interested in starting your own online business rather than a simple income stream. If you have a knack for understanding trends and what people want to buy. Or if you have experience dealing with products, publishing, design, or eCommerce. Or even have a monthly service to offer. My biggest warning is that unless you find a product or line of products that people will want to buy over and over again. Or a subscription service, like a monthly box of coffee or goodies. You’re always going to need new customers. And if you’re looking for something like passive income, that makes the Flea Market Method much less attractive when starting to making money online. Remember Beanie Babies? The cute little soft, bean-stuffed animals that were all the rage in the 90’s. The ones people bought by the dozen. Then sold for exorbitant amounts of money later. Not only did people become repeat buyers. But they also became collectors. They self organized in a type of community. In fact, I just checked and there are still numerous Beanie Baby Collectors groups on Facebook. One with over 5,000 active members. The Beanie Baby Method is somewhat of a hybrid between the Deadhead Method and the Flea Market Method. The product and the community are built together. Now, I was never into Beanie Babies, but I am an Apple fan. And Apple does this on a larger scale. They’ve mastered it. They have always encouraged their customers to organize as Mac users. It’s built into the product. They work together. They don’t play nice with others. Remember the PC vs a Mac commercials? First you buy a Mac. Then an iPod. Then an iPhone. Then an iPad. And then a newer iPhone. They give you a sticker of a white apple to put on the back of your car. This let’s other people know you’re in the club. But the point is this, you have a mix of community and sales. At the same time. You sell a product or service while trying to build a community around it. The upside is that you have the potential to build a community, and make money sooner. The downside is that you risk doing neither well. Primarily due to lack of focus. Or worse, you destroy your attempt at building an audience by trying to sell them something too soon. But if you already have an audience, following, or fan base, the Beanie Baby Method may be perfect for you. I know several people who built a following on Facebook or Instagram, and then launched a product or service right out of that. Another good use of the Beanie Baby Method is if you have a deep, personal understanding of your community. If you know what they want and you know how to organize them. Otherwise, go another route. You’ll thank me later. Nice article! I like the examples, they make it easy to visualize the different methods. Thanks, Jenny! Glad you found it helpful. Which method are you using (or are you still figuring that out)?